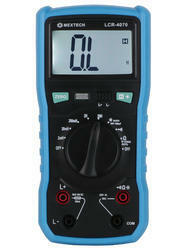 We are one of the renowned dealers and stockiest of an array of digital LCR meters. These are procured from the leading manufacturers and vendors under the guidance of the experts. All the products procured from the vendors are tested at our facility to ensure these are at par with the prevailing industry standards. Our range finds application in the construction owing to the features such as corrosion & wear resistant, durability and compact design. We are an acclaimed trader of Digital LCR Meters DT4070, which finds application in various automobile purposes. These are manufactured using quality alloys which have maximum concentration of corrosion resistant metals. Product offered by us can be customized in accordance with the requirements of the clients at our vendors facility. Max. Displaying: 1999 (3 ½ Digit) Auto Polarity indication. Operation environment: (0~40) °C, RH.<80%. Accessory: Operational Manual, Gift Box, Test Leads, And battery.